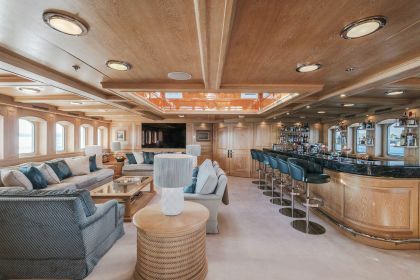 An amazing 90m vessel built by Corsair Yachts, NERO was inspired by the ‘Corsair’ series of yachts owned in the start of the 20th century by J.P. Morgan. 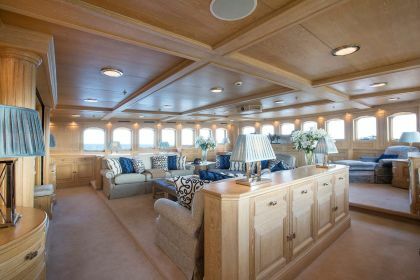 Completed in 2008 and completely refitted in 2016 contemporary classic elegance are the key words for describing this amazing yacht. 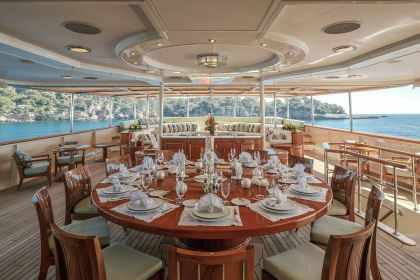 With her exceptional design and quality of construction, every aspect of life on-board has been thought through, down to the smallest of details, making her a worthy winner of a 2009 ShowBoats Award in the category of Best Motor Yacht Over 75m. In 2016 Nero has been extensively updated and re-freshened throughout with an entirely new palette. 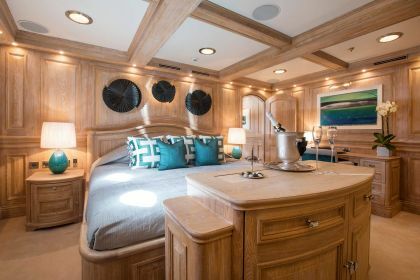 The state of the art upgrade comprised of a full overhaul of all soft furnishing, New LED lighting systems, re-plating of all fixtures and fittings, complete rework of the woodwork throughout the yacht. 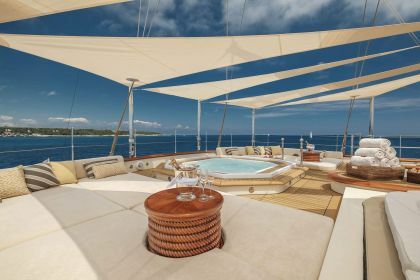 New “fly-sails” (sun awnings) shade system on the top deck creates an entire outdoor shaded dining area, the installation of a large guest bar area with custom made bar stools, New 7th cabin allows more flexibility with guest sleeping arrangements and a full yacht repaint. 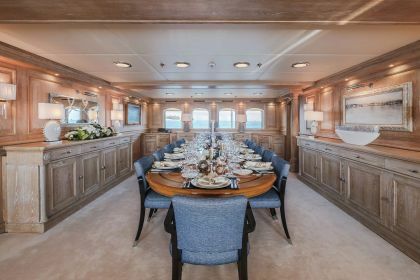 NERO is a truly unique yacht that can be effortlessly transformed from the most comfortable family yacht into a stunning venue for larger events, with huge deck spaces, as well as multiple exterior seating and dining areas, catering for both large gatherings and the more intimate moments of life on-board. 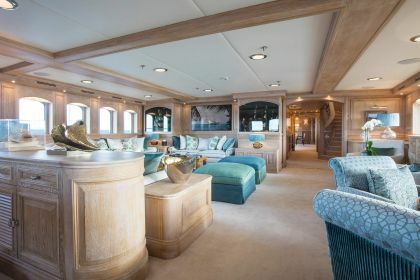 The yachts “Snug” is one of the many highlights of NERO, situated on the sundeck makes an ideal place to escape from the heat of the midday sun or host a cosy dinner. 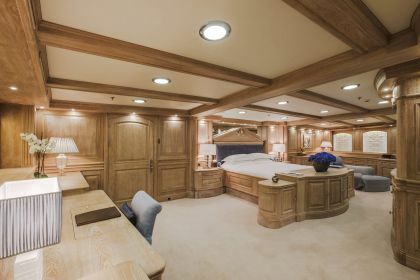 The magnificent master duplex apartment with private lounge and dining saloon, dressing room, his and her bathrooms and private access to observation saloon/cinema and office sets the standard for the remaining five luxurious staterooms all with ensuite dressing rooms and large bathrooms allowing guests to enjoy the full NERO experience with exceptional style and comfort. 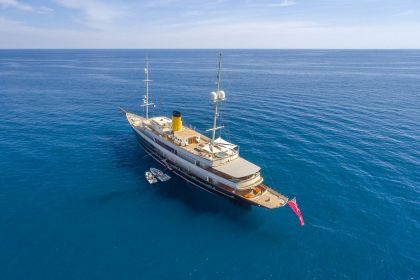 NERO is the only modern classic motor yacht of this size in existence. 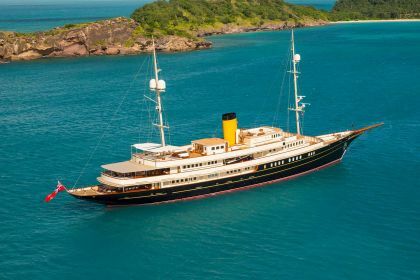 Embodying luxury and elegance for guests to wind down in the ultimate style in some of the world’s most stunning cruising grounds, she is admired for her beautiful lines and classic styling wherever she goes, and stands out as one of the iconic yachts of the modern era. Tender + toys: 2 x Inflatable SUP's (Stand up Paddleboards) 1 x 9.5 metre enclosed cabin classic tender & custom built by Corsair Yachts (2016 repainted and upgraded) 1 x 7.39 metre Zeta Elle tender (New Oct. 2015) 1 x 5.2 metre Nautica rib & custom built (overhauled in 2016) Waterskis 4 x inflatable types of towing toys Snorkelling gear Fishing gear Water soakers Inflatable chairs and lilos,trampolines, donuts and dive gear. 2 x canoes DIVING: The yacht has a very capable compressor, 6 bottles and 2 sets of gear. They can be fully self supporting except to lead dives, quite easily. 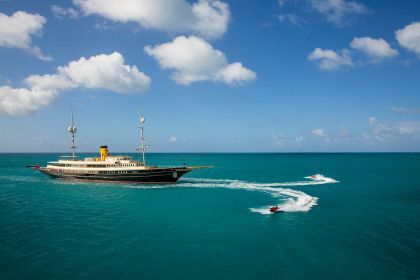 There are competent divers on board who can manage and rig gear for guests. They can be fully self supporting except to lead dives, The local dive master would merely have to show up and lead the dives. Approved RYA Watersports Centre - NERO is a registered Jet ski school with an on-board instructor who can provide a training session in order to issue charter guests with a licence, valid for the duration of the charter.